Discover many and diverse space concepts at every place and for every use. The LIRI team will prepare the optimal solution for every need for your mobile location in a performance-oriented and dedicated manner. We create the appropriate space for your wedding events: Our tent ensembles and whole tent landscapes can transform city centres and parks into exciting promenades. And they are meeting places for your visitors and guests to enjoy your wedding. 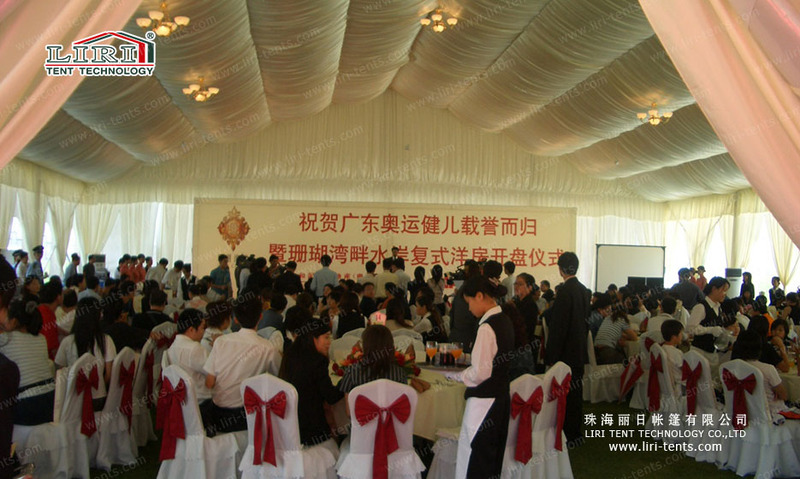 To make your wedding high end, you need some luxury decorations with the marquee tent, like draping linings to cover the top and avoid the buck frame and PVC fabric of marquee tent; curtains will make guests feel like at their own house and comfortable; lightings with different colors to ensure your wedding unforgettable. One more thing need to consider is air-conditioner system, which is available from Liri Tent, either. Liri tent always offer your best mobile space solution for your outdoors events.